Lasers from Laserline, one of the leading laser manufacturers in Germany, are amongst the most successful beam sources for industrial applications in the multi kilowatt range. We are proud of that fact. Laserline was founded by Dr. Christoph Ullmann and Dipl.-Ing. (graduate engineer) Volker Krause in 1997. But how did they actually do it? These two technology pioneers were convinced that it would be possible to develop an alternative beam source for industrial laser material processing based on a known laser diode from the 1960s – the diode laser. At the beginning, the project was rarely taken seriously, because the single diode seemed much too weak as an element of the industrial laser. However, Ullmann and Krause stuck to their vision. And within only a few years, they developed an innovative tool that conquered entire industry sectors with respect to fiber laser manufacturers, fiber laser companies and laser equipment manufacturers. Thanks to their inexhaustible pioneering work, which has received multiple awards, Laserline’s powerful lasers meanwhile have been firmly established in many production chains. Laserline is one of the top laser manufacturers, if you search for laser company names or industrial laser manufacturers. What began as a small team at the Koblenz Technology Center has today become the embodiment of industrial laser technology itself. Since 2002, Laserline is now located at its own ca. 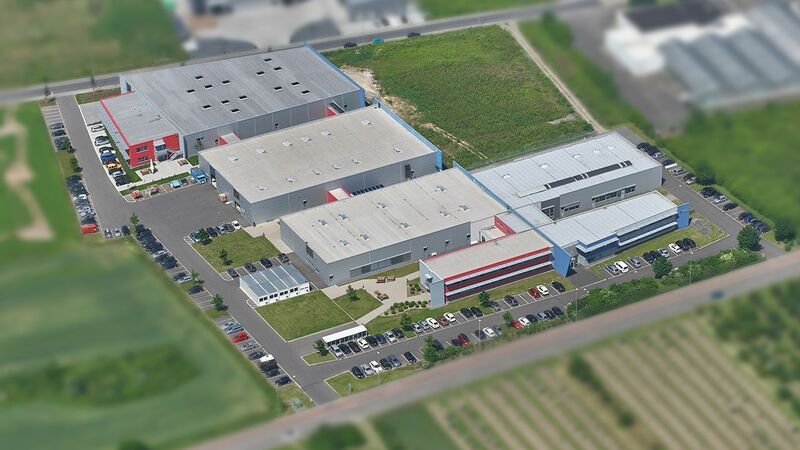 15,000 m² premises in Mülheim-Kärlich, Germany, with production in state-of-the-art production plants, thinkers in innovative development laboratories, and six international subsidiaries laser manufacturers in usa, Brazil, Japan, China, and South Korea, all the while working with distribution partners in Europe (France, Italy, Great Britain) and in the Asia-Pacific region (India, Taiwan, Australia). Today, more than 300 employees work for the laser company. We only accept physical borders, all others will be overcome: that is why we keep working on improving the power and beam quality of our diode lasers on a daily basis. Small but powerful: laser manufacturing of industry lasers with special focus on innovation, we always work on even more compact high-power lasers that prove themselves with high energy efficiency and operational reliability even under trying conditions. It is all about you: we do not simply produce, we can realize tailored solutions including supplementary components. For us, this includes offering the best possible pre- and after-sales service. Based on tried and tested principles, our current industry lasers offer a standard power of up to 25 kW and can achieve an extraordinary high efficiency rate of almost 50%. We are laser tool company, one of the best laser companies. Meanwhile, in the power class of up to 4 kW, converter lasers with high beam powers of up to 4 mm mrad are available. Combined with consultative, conception, individual additional components, as well as a huge portfolio of services, this makes us the international leading laser manufacturer of high-power lasers. From this philosophy, lasers have emerged that today offer up to 25 kW power as standard and can even reach an unusual high efficiency of almost 50 percent. Meanwhile, in the power class up to 4 kW, converter lasers with high beam powers of up to 4 mm mrad are available. Laserline’s diode lasers are long-lasting, low-maintenance, and compactly built thanks to an innovative diode cooling technology and they are even available as 19" rack mount laser. Furthermore, customized laser designs are created, realized and thoroughly tested in our own application laboratory. Additional components such as processing optics, scanners, beam switches, and monitoring systems round off Laserline’s growing portfolio. Training as well as service and maintenance agreements are offered to users. In case of malfunctions, a 24/7 service hotline and teleservice with remote diagnosis and remote maintenance are available. Typical fields of use for Laserline’s diode lasers are classical industrial applications in material processing like welding, brazing, hardening, softening, and realization or repairing of coatings. Additionally, Laserline’s diode lasers have become established in plastic welding and in newer manufacturing processes like additive manufacturing (metal 3-D printing) or welding of fiber composites. The users are primarily from the automotive industry, or the engineering, tool- and mold-making industries. Also in the aerospace and heavy industry, many companies today count on Laserline. Dr. Christoph Ullmann and Volker Krause founded Laserline GmbH in the Koblenz Technology Centre. These two technology pioneers developed and sold the first direct diode lasers – at the time with the design of a photo camera from the fifties with powers of 500, 900, and 2000 W. The company and its products will be introduced to the general public for the very first time at the fair LASER World of Photonics (Munich, Germany). Laserline’s first industry application is the wire-based laser cladding. Here, the Laserline diode laser is integrated into a high-speed milling machine. At the first “StartUp” competition for new businesses – organized by Sparkassen, McKinsey and the magazine STERN – Laserline becomes the Rhineland-Palatinate state winner and ranks third nationwide. The award is personally handed out by the former President of the Federal Republic of Germany, Roman Herzog, and is confirmed by a further success in the industry: Laserline’s diode lasers are used in plastic processing for the very first time. The world’s first multi laser system for plastic welding is equipped with Laserline’s diode lasers: the laser manufacturer outperforms all competitors and receives the order to deliver a hundred multi diode laser systems. Furthermore, at the fair LASER World of Photonics, Laserline presents the first fiber coupled diode laser with 500 W power and 600 µm optical fiber. Suitable for metal cutting, it makes an application accessible even though it was hitherto considered unattainable for the diode laser technology. The company’s swift growth requires an increase in capacity: in the presence of numerous representatives from the local government, the ground-breaking ceremony takes place for the new Laserline premises situated in Mülheim-Kärlich, Germany. Product development is also proceeding rapidly: fiber coupled diode lasers are now available with powers of 2000 W (1000 µm fiber) or 4000 W (1500 µm fiber). By connecting 500 W diode lasers with a scanning system, the first dioscan system for quasi simultaneous plastic welding is created. Highlight of the year: AUDI is the first automotive manufacturer to use Laserline’s diode lasers for brazing tailgates – a milestone in the industrial applications of this nascent technology. Laserline says goodbye to Koblenz Technology Centre and moves into its own premises in Mülheim-Kärlich. Meanwhile, the company now counts 35 employees. Altogether, the 2,500 m² operating area now offers enough space for further growth. 200 guests attended the inauguration ceremony on 14.11.2002. The guest of honor was the Rhineland-Palatinate Minister-President, Kurt Beck. The beam quality of fiber coupled diode lasers is optimized: 850 W laser powers are available via 400 µm optical fiber with numeric aperture (NA) of 0.2; 4,000 W via 1,000 µm fiber with the same NA. To increase availability, the lasers can now be equipped with an electronic stack management. The management system recognizes a defect laser stack, turns it off, and automatically values the new characteristics of the laser. Also new is a teleservice: a system failure can be diagnosed worldwide online, and customers get support via telephone. Also, the application range has been increased: Laserline’s diode lasers can now be used for repair welding in oil production. Again, the laser manufacturer has managed to increase the power of fiber coupled diode lasers: via 1,500 µm fiber with numeric aperture of 0.2, now 6,000 W laser powers are available for users. The power of direct Laserline diode lasers is from now on increased to an unmatched 10,000 W. Furthermore, Laserline can significantly improve the beam quality of its fiber coupled diode lasers for the second time within a very short period. Specifically, there are now laser powers of 400 W via 400 µm fiber, 3,000 W via 600 µm fiber, and 6,000 W via 1,000 µm fiber available with numeric apertures (NA) of 0.2. In the course of its continuously growing international business, Laserline opens its first subsidiary at the Silicon Valley, California. Laserline’s diode lasers are used for the tape laying of fiber composites for the first time, amongst others in aerospace, oil and automotive industries. By building a new production hall, its premises in Mülheim-Kärlich are expanded to 4.300 m². At the LASER 2007 in Munich, Laserline exhibits a fiber coupled diode laser with 4,000 W laser power via 400 µm fiber. Until then, a comparable connection of beam quality and power was only reached by lamp-pumped Nd:YAG lasers. Laserline sells its 1,000th diode laser and brings to the market the world’s first diode laser with a beam quality of a lamp-pumped Nd:YAG laser (30 mm mrad) with laser powers of 4,000 W. The third highlight of the year: Laserline is qualified by AUDI as a beam source supplier for aluminum welding. The first application field is the welding of tailgates for the AUDI Q5. For the first time, a Laserline diode laser is integrated into a system for the sealing of narrow surfaces at furniture edgebands. Thus, the furniture industry has also become a new area for applications. Laserline establishes a quality management system corresponding with DIN EN ISO 9001:2008 in the complete company, and is certified by TÜV Süddeutschland. The pioneering work in the field of diode laser technology is rewarded by Sparkasse with the regional startup award in the category "creative entrepreneurial perfomance". Appropriately, at the product-site, the next power performance boost can be registered: since the LASER World of Photonics, fiber coupled diode lasers with 15,000 W output power via 1,000 µm fiber have become available. At the end of the year, three new additional subsidiaries will be opened in Asia: Shanghai/China, Seoul/South Korea, and Tokyo/Japan. Meanwhile, over 110 employees are working for Laserline worldwide. Laserline’s growth shows no sign of slowing down. By building a new production hall and a new office building, the total area of its premises in Mülheim-Kärlich is now 7,400 m². In several plants for welding of tailored blanks, Laserline’s diode lasers have successfully replaced the until then established CO2 lasers. Essential for the customer’s choice is the high efficiency of the diode lasers. The quick growth of Laserline is also unmistakable when it comes to personnel: at the end of the year, the company counts more than 160 employees. At the LASER World of Photonics, Laserline presents for the first time a diode laser with a beam converter boasting an output power of 4 kW at 8 mm mrad beam quality. Furthermore, Laserline diode lasers with powers of up to 20,000 Watt are now available. On the application side, diode lasers are used in remote welding for the first time. Additionally, the new beam converter laser renders applications with huge working distances possible. In April, Laserline opens a new sales department in the premises of the US Fraunhofer Institute in Detroit. The number of employees in the company headquarter in Mülheim-Kärlich is growing continuously, reaching about 200 in October. The maximal power of Laserline diode lasers can be doubled within a year to 40,000 W, a prototype with this output power is presented at the LASYS in Stuttgart. Additionally, Laserline also sets up its new OTS-5 stainless steel optics. Diode lasers are now used in the additive manufacturing of components: diode laser-based cladding makes it possible to produce the desired shapes and structures almost without material loss, rework or tool wear in only one single step. Laserline now counts more than 230 employees. In September 2015, a new production hall with a connected development center was opened. At the LASER World of Photonics, Laserline introduces the new product family LDF of the meanwhile 6th generation to the market. Furthermore, for the first time a prototype with 50,000 W output power is presented. At the end of the year, a new sales department is opened in Sao Paulo, Brazil. Worldwide, Laserline now counts more than 260 employees. Brazing with a triple spot module, developed by Laserline, has attracted much attention and is rated as an advanced procedure for brazing hot galvanized sheets in the automobile industry. The industry laser manufacturer Laserline celebrates in 2017 its 20th anniversary as a company. Discover more! Laserline received the AKL Innovation Award for the development of a multi-spot module this past May. By doing so Laserline has put an end to the increased spatter formation which previously occurred during brazing of hot-dip galvanized sheet metal. The module combines a homogeneous rectangular spot with two round pre-spots that can be adjusted as required. From the “Efficient High-Power Laser Beam Sources (EffiLAS)” program, funded by the German Federal Ministry of Education and Research (BMBF), came a direct blue high-power diode laser as an additional trend-setting development. The availability of the blue high-performance diodes made this possible for the first time. The company's growth is not only reflected in further employee increase - to now 360 but also the subsidiary in China had grown and therefore had to move to a new, larger building.